It may come as a surprise to see refugees from the turmoil in Venezuela warmly welcomed in Hungary - by a government widely known to be hostile to immigration and asylum. All those who apply must prove Hungarian ancestry, however distant that might be. Government spokesmen have been at pains to insist that they are genuine Hungarians "coming home", though very few were actually born in Hungary, let alone speak Hungarian. Most Venezuelans with Hungarian ancestry emigrated in two waves. The first, after World War Two, included many associated with the Miklos Horthy regime which sided with Nazi Germany. Some had been involved in the deportation of Hungarian Jews to Nazi death camps. A very different group of around 400 followed after the 1956 failed revolution, including some who had fought the Soviet army on the barricades in Budapest. The community has since swelled to several thousand. Many young Venezuelans without any Hungarian ancestry were attracted by the vibrant cultural life of the community in Caracas, with its dance and scout groups. Only when the situation deteriorated rapidly in 2017, when hunger was accompanied by arbitrary violence, did community organisers turn for help to the Hungarian government. The 350 who have arrived have been generously received, with enrolment in language classes and accommodation and integration for the first 12 months. The irony is that the programme has been drawn up by an inter-ministerial team from the Fidesz government, which has bitterly opposed immigration for the past four years. Nationalist Prime Minister Viktor Orban has built his campaign for the European Parliament elections in May entirely on opposing immigration to the European Union. The campaign of billboards and newspaper ads has been condemned by the EU as distorting the truth and aiming to "paint a dark picture of a secret plot to drive more migration to Europe". Most refugee integration programmes here were abolished by the government in 2016 and 2017. Only 94 people were granted asylum in Hungary in the first nine months of 2018. Another 290 were given lesser forms of protected status. The Venezuelans' arrival was revealed by independent news website Index and Hungary's authorities have asked those taking part in the scheme not to talk to the media. "The government made clear to us that this would be difficult to communicate - because of its own hysterical anti-migrant campaign," said one of the Venezuelans already safely in Hungary, who asked that his name not be used. "They insist on the word 'repatriation' - but this was rather loosely applied at the start. Now, the conditions have been tightened." Their cause was eventually championed by deputy Prime Minister Zsolt Semjen. "It was hard at first persuading the government just how bad the situation there had become. That my monthly pension barely covered a single meal," my source said. "We did not become refugees lightly. Especially those of us who were refugees from Hungary in the first place. We knew that we may lose our life's work, our flats, everything we had in Venezuela." Plane tickets and even transport to the airport were arranged through the Hungarian embassy in Ecuador and the Hungarian Maltese Charity Service. The first Venezuelans arrived in April 2018 and all are deeply grateful to the Hungarian government for its assistance. But the peculiar anti-migrant atmosphere cultivated by the Orban government has led to some tragicomic scenes. When the new arrivals were placed initially in the tourist resort of Balatonoszod, local Hungarians boarded up their windows and phoned the police in panic when they noticed what they called "negroes" in the streets. "It's true some of us are quite dark-skinned," laughed my Venezuelan contact. "But some of us are more Hungarian than Hungarians!" What next for Hungary's immigrants? One year on, the children are already fluent in the language, and well-integrated into their local schools. "They love the freedom to go out in the streets safely. The freedom to study, to be themselves here, to be exotic," said another parent. But worries plague the older people among them. Image caption This unassuming hotel west of Budapest houses Venezuelan refugees who have "returned"
"What will we do when our year is up, and the charity extended to us ends? We are not entitled to pensions here," one told me. That is just one of the problems Hungary's ministry of human capacities is trying to solve. Opposition parties have accused the government of hypocrisy for taking in Venezuelans but rejecting Syrians, Iraqis or Afghans. 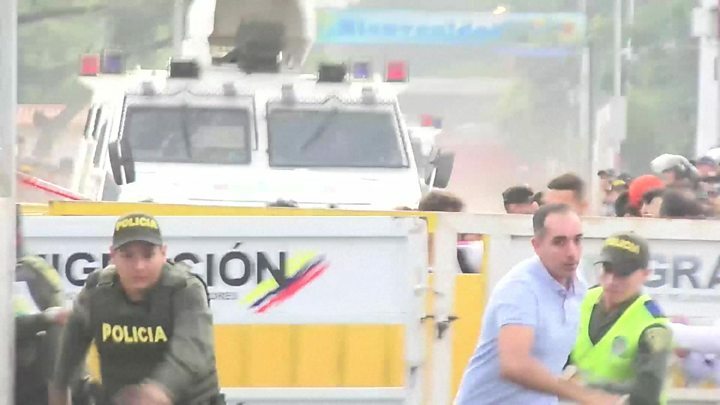 The Venezuelans fear such attacks might dilute the government's willingness to allow in those still queuing to escape. They have noticed a lull in new arrivals, as the government assesses whether the current Venezuelan government will survive. Under laws passed in Hungary in 2018, organisations and individuals which help migration can be fined or even jailed and have 25% of their income confiscated by the state to fund border defences. The Hungarian opposition jokes that the state should in this case fine itself. 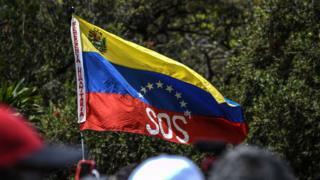 I ask my contact: if the Maduro government falls, would you return to Venezuela? "Of course. That is my home."